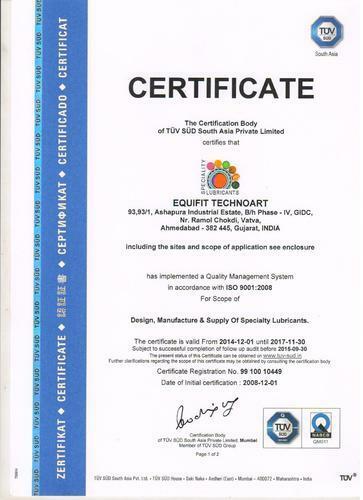 Located at Ahmadabad, Gujarat, India, we, “Equifit Technoart,” are engaged in Manufacturing and supplying of a quality range of products like Anti Seize Compound, Graphite Dispersion, Silicone Grease Lithium Soap, PTFE Grease, Synthetic Gel Grease, Synthetic Chain Oil, Aerosol Spray and much more. Our products keep the equipment and machinery in optimum working conditions. Moreover, these also enhances working life, productivity and profitability along with decreasing maintenance costs and downtime. We have also developed a state-of-the-art infrastructure to manufacture these products in line with international quality standards. Our quality controllers conducts rigorous quality testing on well defined quality parameters to ensure a flawless product range at clients' end. We also offer our products at industry leading prices without compromising on quality. Our quality centric, client oriented, transparent and flexible business approach has made us capable of catering to industry segments like Ceramics, Steel, Engineering, Chemicals and Textiles. We also conduct regular training sessions to keep them abreast of prevailing market trends and evolving clients' demands. With these training sessions, our professionals have enhanced their skills and with their enhanced skills, they manufacture an improved quality range of Lubricants and Greases. They also work in close coordination, in order to conduct a hassle free manufacturing process.